Seremban (Jawi: سرمبن; Chinese: 芙蓉) is the capital of the Malaysian state of Negeri Sembilan, located within the district of Seremban, one of the seven districts of Negeri Sembilan. The town's administration is run by the Seremban Municipal Council also known as Majlis Perbandaran Seremban. 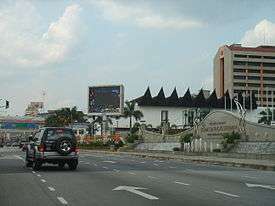 On 9 September 2009, Seremban was to be declared as a city, however it was later deferred due to technical reasons. However, the idea of granting city status has been brought up again and Seremban is expected to become a city in the near future. Seremban was originally founded as Sungei Ujong (or Sungai Ujong), named after a nearby river of the same name. While the town was renamed Seremban thereafter, the Sungai Ujong name most prominently persists as a street name for a road adjoining the southern side of town (Sungai Ujong Road, or Jalan Sungai Ujong). The town is also referred alternately as "Fu Yong" (Chinese: 芙蓉，literally"hibiscus") among the Chinese-speaking community, although the name is unrecognised officially. 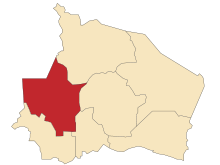 District of Seremban is one of 7 districts in Negeri Sembilan, Malaysia. This is where the capital of Negeri Sembilan, Seremban town is located. The Seremban core areas come under jurisdiction of Seremban Municipal Council (MPS). The outer Seremban areas come under jurisdiction of Nilai Municipal Council (MPN). Seremban 2 is a new satellite township about 4 kilometres south-east of the existing old Seremban town centre. Located on the western side of the North-South Expressway, Seremban 2 is a planned township built on former oil palm estate land with the aim of relocating the administrative and business district from the crowded old town centre to a more organised area. Seremban 2 (Malay: Seremban Dua ;Chinese: 芙蓉新城; pinyin: Fúróng XinCheng) is a satellite town located about four kilometers southeast of downtown Seremban in Negeri Sembilan, Malaysia. Located west of the North South Expressway, Seremban 2 is a planned city built on a former oil palm plantation site. It was established with the aim of relocating the administrative, business and education services in Negeri Sembilan away from the capital. Several shopping malls have been opened in Seremban 2, such as ÆON, Tesco, Mydin and S2 Mall. Seremban 2 covers over 2,300 acres (9 km2) of land, including the Seremban District Administrative Complex, the Seremban Court Complex, the Seremban district police headquarters and the Fire and Rescue headquarters NSW.